Want to reduce your impact on the environment? 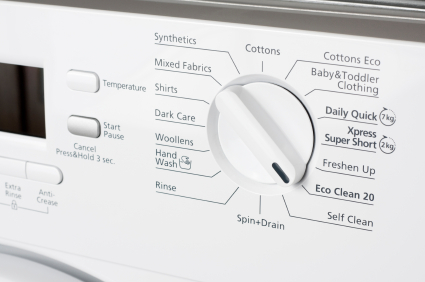 Here are 5 eco-friendly laundry tips that will help you do your part. You can save money, prevent water pollution, minimize your energy consumption, and reduce your exposure to harmful chemicals simply by making a few changes to your laundry day routine. Doing your part for the environment is easier than you might think. 1. Use cold water. Most energy used to wash clothes involves just heating up the water. By using cold water, you can cut your energy consumption by nearly 90%. And if you’re washing in soft water, you get the same clean with cold water. 2. Wash full loads. Reducing the number of loads you do each week will save water, money, and time. Just make sure you don’t go overboard. An overloaded dryer can dry clothes unevenly and take a long time. 3. Buy natural detergents. Natural detergents and stain removers are usually free of petroleum products and are often formulated for cold water washing. 4. Choose a non-chlorine bleach. Chlorine bleach can irritate skin and eyes, and is damaging to the environment. By switching to non-chlorine bleach, you can reduce the amount of chlorine your family unintentionally contributes to the environment. 5. Sort your laundry. Wash and dry towels alone, and separate heavyweight and lightweight items. Loads of similar weight items dry faster and more evenly. At NJ Laundromats, we make being eco-friendly easy. Many of your laundromats use soft water, so you can wash your clothes in cold water with as much cleaning power as warm water. Find a laundromat near to you.